This past weekend we found ourselves in the Papillon area in search of the new kid on the block, Circo’s Pizza. Unfortunately, Circo’s wasn’t quite ready for business yet as they’re still putting the finishing touches on their new place. So after the disappointment faded, I grabbed the iPhone and searched for some pizza in the general area. 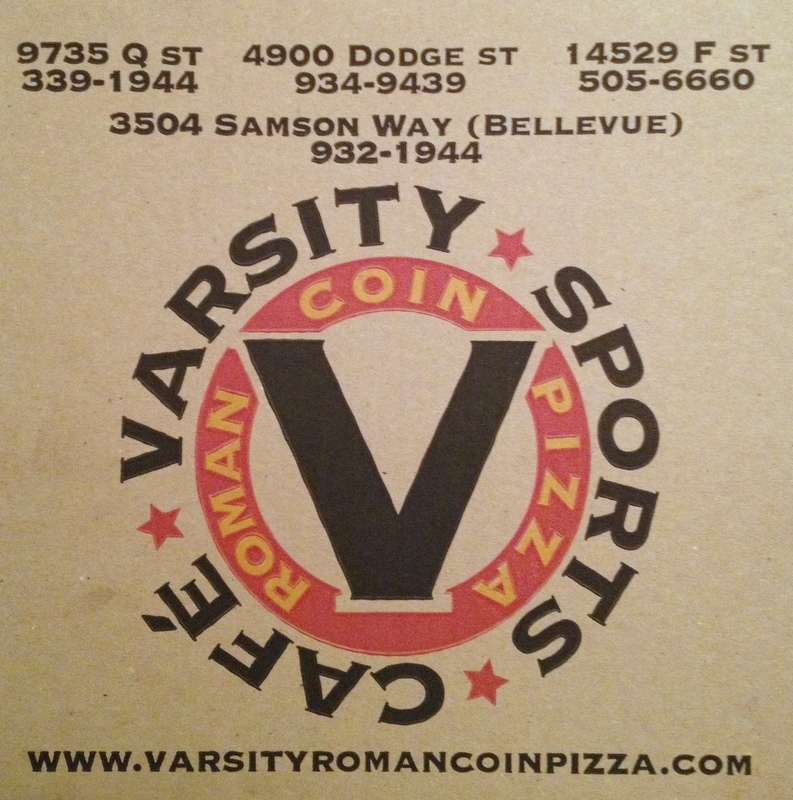 After automatically discarding Pizza Hut and Little Ceasars, I spied an old favorite: Roman Coin Pizza located in the Varisty Sports Cafe in nearby Bellevue. The Bellevue location sits just north of highway 370 and east of 36th Street. There you’ll find a small strip mall anchored on the east by the Varsity Sports Cafe and Roman Coin Pizza. They have a nice, covered outdoor seating area as well as a large bar and dining space inside with more TVs than should be allowed in one location. If you want to watch a sporting event, this is the place. Since I was getting this order to go, I grabbed a seat at the bar, ordered a drink and perused the menu. Their menu features the standard apps like chicken wings and mozzarella sticks, salads for those that don’t want anything tasty, wraps, burgers, sandwiches and of course, pizza! Roman Coin is pretty well known around the Omaha area (they have four locations!) for producing some pretty good hand tossed pizza, but what you may not know is they also have a “deep dish” pizza on the menu. I decided to order one of each. For the Pizza Wife I ordered a hand tossed veggie pizza and I got a Meat Lovers deep dish for myself. Now, I’ve had more hand tossed pizzas from Roman Coin than I’d care to admit, but I’d never had one of their deep dish pizzas before. Uncharted waters – how exciting! Not long after I polished off my Jack and Coke, the pizzas arrived from the kitchen and I rushed off to join the Pizza Wife for dinner. The hand tossed veggie pizza was basic but good. 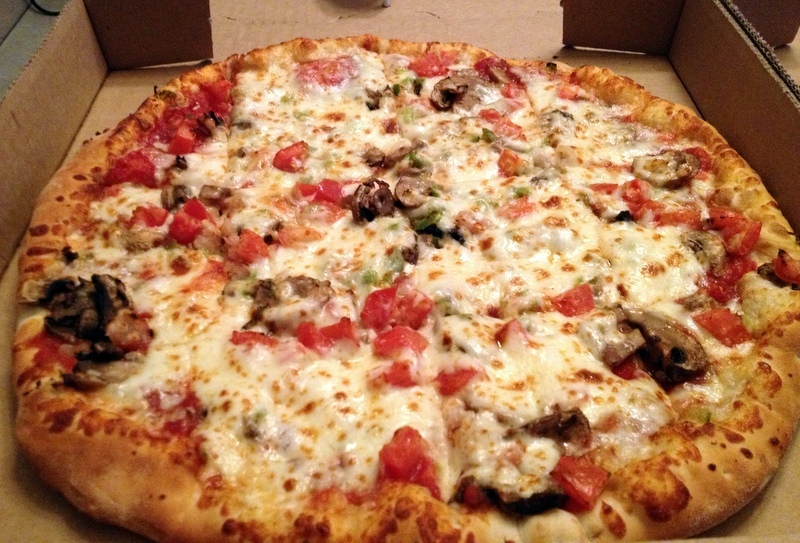 It comes with the standard veggie fare including black olives, green peppers, onions, tomatoes and mushrooms. 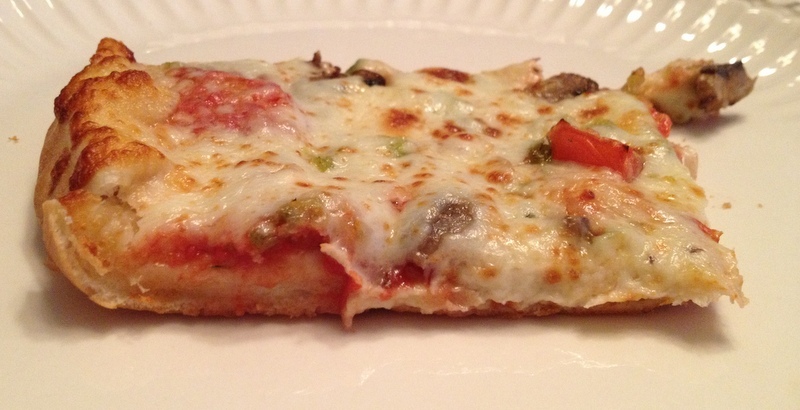 It wasn’t the best veggie the Pizza Wife has had, but it did the trick, and she gave the chewy crust high marks. The deep dish pizza was, well, not a deep dish pizza. Let me make this perfectly clear: Roman Coin does not make a deep dish pizza. Roman Coin makes a pan pizza. HUGE difference and a big disappointment. Disappointing not because of the quality of the pizza, because it was certainly good. Disappointing because I was expecting a deep dish pizza. I mean hell, the menu says “Chicago style deep dish pizza.” Deep dish pizzas have a flaky crust with tall edges and are loaded with your toppings of choice, mounds of cheese and sauce covering it all. What Roman Coin calls a deep dish pizza is no more than a regular pizza with a bit taller sides. I suppose I really shouldn’t say it’s a regular pizza, since they clearly use more dough for this one than they do their regular hand tossed pizza. In addition to it having a bit taller edge, the overall thickness is greater than their normal hand tossed pie. So now that I’m done bitchin’ about the what they call it, let’s talk about the actual pizza. The deep dish pan pizza was absolutely loaded with meat and cheese. This pie starts off with a thicker crust than their hand tossed offering. 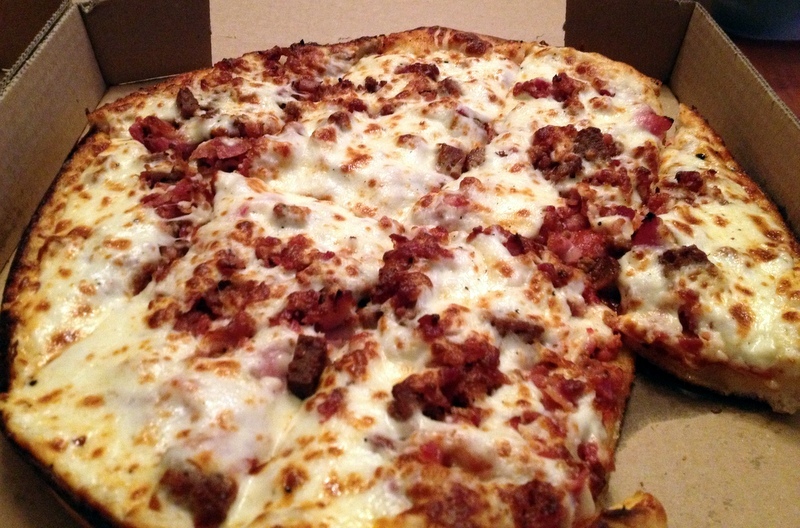 Then it’s topped with the same zesty tomato sauce, piled high with pepperoni, beef, bacon (mmm, bacon), ham and sausage. Next is an artery clogging amount of mozzarella cheese that tops off this beast. The crust had the same chewy consistency as their hand tossed pizza leading me to believe the dough is the same for the pan pizza and their thinner pizza, just more of it. All in all it was a damn tasty thick crust pan pizza. Just stop calling it a deep dish, would ya? Overall we liked both pizzas. The abundance of toppings, zippy sauce and chewy crusts get high marks from the Omaha Pizza Review crew, and it makes it easy for us to recommend them to you. So long as you don’t show up expecting a real deep dish pizza, you shouldn’t be disappointed. 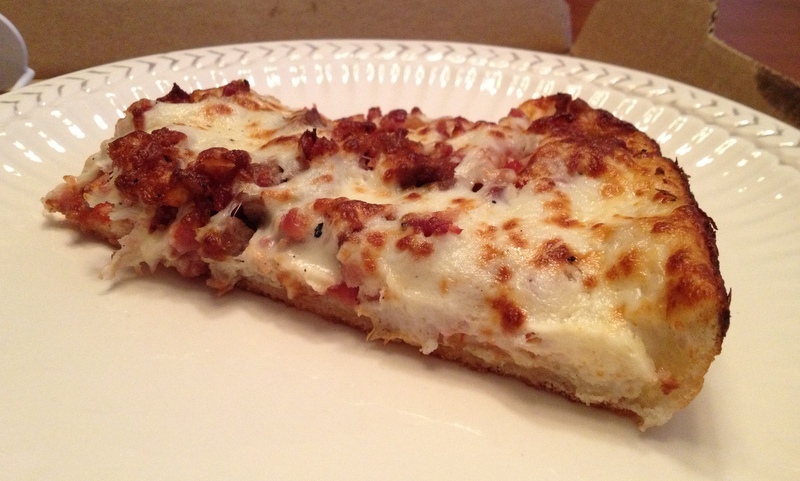 Crust: Thin was thin and chewy. Pan pizza was, you guessed it, thicker and chewy. Cheese: Plenty of it and on top of everything. How would you rate Roman Coin Pizza? Click on the stars below! This entry was posted in Pizza and tagged Roman Coin Pizza. Bookmark the permalink. Welcome back Pizza Dude! It is about time. Have you come across an actual “chicago style deep dish pizza” around here? That would be nice. Pudgy’s Pizzeria at 168th and Harrison has the closest thing to deep dish around here that we’ve found. We have not tried the pie or reviewed them yet. But from what others have said, it is the best deep dish around these parts.